For many people who come to Crete, and more specifically Heraklion, the question on their minds is "Why are we here?" Of all the beautiful islands and ports in the Mediterranean why is Heraklion on the itinerary of most of the cruises and even people who come to Greece on their own to visit the islands? It is just a city and not a particularly attractive one at that. Whose idea was this anyway? 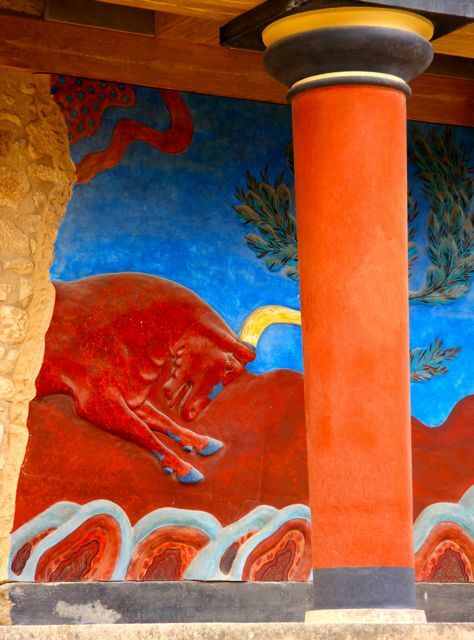 The answer is Knossos. For the last fifty years tourists have been coming to Crete and visiting this ancient site, though few know all that much about it. Most have heard of it and know it is there and that they are supposed to see it and a few have heard about frescoes and the world's first flush toilet. 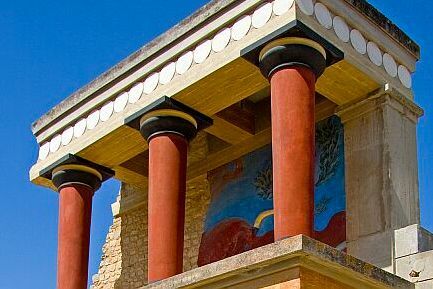 Generally though, most people's knowledge of Knossos begins and ends with their visit to this important archaeological site and perhaps a few forgotten words about it from a childhood history teacher or a brief glimpse of a Discovery Channel documentary while channel-surfing at halftime or between innings. The Minoans came from Anatolia in what is now Turkey and arrived in Crete some 10'000 years ago. Neither Greek nor Indo-European, their language which has been left in written form on stone, is called Linear A and has never been deciphered. 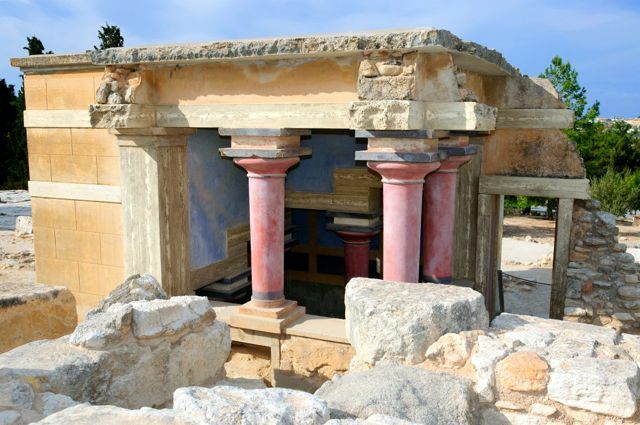 During their stay on Crete they built a number of multi-storied palaces starting at around 1900 BC, which have been excavated and restored and can be visited in Malia, Zakros, Phaistos and most importantly Knossos which was apparently their capital and the largest of these palaces. Between 1420 and 1375 BC the Minoans were either conquered by the Mycenaens or their palaces were occupied by them. The Mycenaens who came from mainland Greece, as you probably remember, are the same guys who fought the Trojans in Homer's Iliad under King Agememnon. But 250 years later the palaces were abandoned and the Greek dark ages began. What happened is a mystery that has been debated by archaeologists and scientists to this day. It has been suggested that when Santorini exploded it sent a tremendous wall of water that engulfed the Cretan coast and while there is evidence that this did happen nobody can say for certain that this was the event that wiped out Minoan civilization. Well maybe they can say it but to know it you pretty much had to be there. For all we know they might have been wiped out by plague or moved away because of draught and the enormous tidal wave washed over deserted cities and empty palaces. Some suggest that the Minoans were the ancient people of Atlantis who vanished beneath the waves without a trace. Knossos was discovered and excavated by Sir Arthur Evans when he bought the piece of land where he believed the palace of King Minos, whose wife Pasaphae gave birth to the Minataur, half man, half bull, supposedly stood, just as Heinrich Schleiman had done earlier when he discovered the ruins of ancient Troy in Turkey. Understand that the ancient people of Crete did not call themselves Minoans. That was the name Evans came up with, named for the ancient king. We don't know what the ancient Cretans called themselves. Though there are walls dating from the Neolithic period 9000 years ago most of what remains is from between 1700 and 1450 BC, built on top of preceding civilizations. 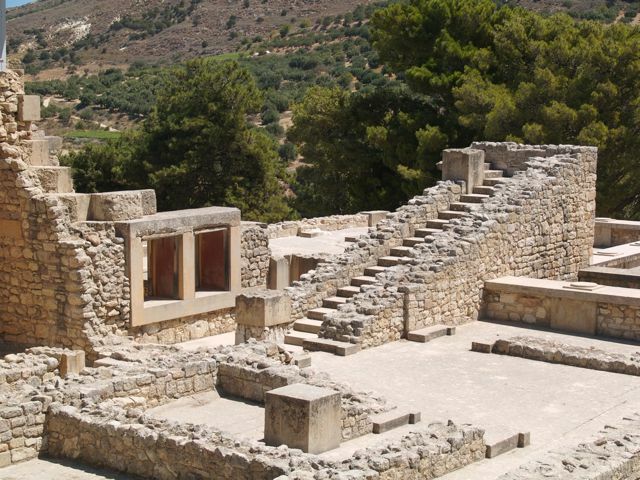 Whatever date you decide to choose for the founding of Knossos, it is regarded as Europe's oldest city. Though much of the walls are ancient some of them are reconstructions and the frescos themselves which are controversial, are replicas. The various rooms are given names like "The Queen's Quarters" and "The Throne Room" but whether this is what they were is a matter of opinion and not based on ancient blueprints. Much in the way that Schliemann's find at Mycenae was declared to be the mask of Agamemnon some of what Evans discovered in Knossos was named because that is what he wanted it to be. Like coming up with a theory and looking for evidence to prove it while ignoring facts that may disprove it. In fact some scholars don't believe it was a palace. And the reconstruction of the ancient palace by Evans? Some scholars have objected that Evans and his restorers rather than discover an ancient civilization had created a modern artifact based on contemporary art and architecture. It has been called the first piece of archaeological evidence that art-deco architecture existed in ancient times, and Evans' idea of what buildings should have looked like was somehow influenced by what they looked like in his day, sort of like imagining Mozart writing a concerto for drums, bass and electric guitar. But rather then let my cynicism interfere with your enjoyment of Knossos, keep in mind that despite Evan's embellishments, this is one of the most important archaeological sites in the world and were it not for Sir Arthur Evan's imagination and discovery we would probably know very little about the so-called Minoans. In fact there would be a whole lot about the ancient world that we would not know since it was through the discovery of the tablets in Knossos that the writing known as Linear B was eventually deciphered by Michael Ventris in 1952. If you are traveling with someone who does not give a damn about Knossos, the Minoans, Minataurs, labyrinths, or ancient flush toilets, whose lack of interest and sensitivity might cause you to be irritated and lessen your enjoyment of Knossos you will be pleased to know that there are tavernas and cafes on the road outside the site where you can leave them with enough money for a beer, an ouzo, or a soft drink if they are children, and a snack and hopefully they will be perfectly happy while you explore Knossos at your leisure. You can get to Knossos by taxi, bicycle or public bus from the terminal in the old harbor. Make sure you visit the Archaeological Museum of Heraklion. Most of the stuff they found in Knossos is there including the famous Dolphin Fresco. 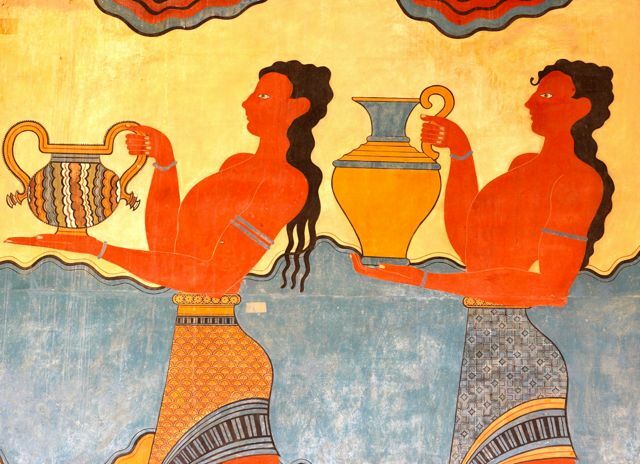 The one in Knossos is a reproduction. Oh yes and about the world's earliest flush toilet; it is in the so-called Queen's Bathroom and is pretty much just a hole in the ground that they poured a bucket of water in to take the waste away. I sense your disappointment but if you think about it isn't that what a modern toilet does too? Thanks to Fantasy Travel for these photos. Incidentally they are a terrific travel agency and specialize in Crete and the Greek Islands as well as the mainland and Turkey. They also specialize in Greek Island Cruises, all of which stop in Crete.